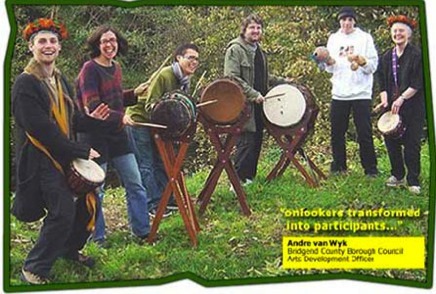 Aaron Meli of Slappingskins has developed a unique African percussion workshop which has worked with PRU units, hospitals, special schools, nursery, primary and secondary schools all over the UK. Slappingskins is available for all sorts of events including corporate team building, private party celebrations and now weddings! 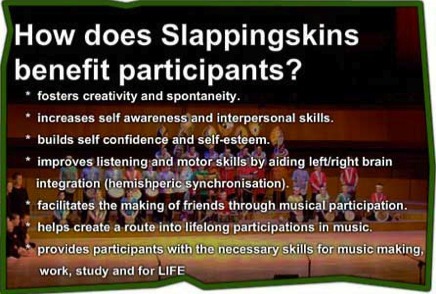 Slappingskins usually works with up to 30 drummers at a time on a coherent music workshop which introduces different instruments from a range of different cultures, allowing participants to have fun learning the basics of playing these instruments. Each workshop guarantees a drum (djembe, darabuka, bougarabou) for each participant and plenty of time for everyone to enjoy playing the instruments. Larger groups can always be accommodated. Slappingskins was created by Aaron Meli in summer 2002. 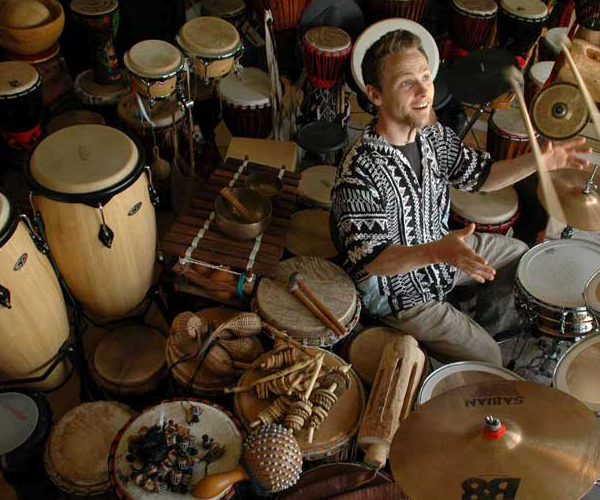 Aaron is an experienced percussion tutor who instructs and performs with djembe (West African hand drum), djun djun drums, bodhran, cajon, congas, bougarabou and darabuka. Aaron plays and performs on drum-kit and other world percussion. Aaron's first experience of drumming came in the form of West-African traditional rhythms via Mamady Keita in Japan where he studied for over 3 years. Aaron bases many of his workshops around these traditional West-African rhythms as he has a special affinity with the djembe. Aaron works with many youth groups throughout the UK and has organised teams of youngsters to perform in front of large audiences. Aaron is busy during the summer months on Carnival and festival work and leads groups that he has tutored through processions and parades. Aaron is a regular at Glastonbury festival since 2010 performing on small stages and facilitating daily drumming workshops for the festival crowd. Mannifest, Sunrise festival, and Camp Bestival are just a few of the events that Aaron has taken Slappingskins to and Aaron is a regular at Greenman festival since 2003 facilitating the Kids Field Drumming. Aaron works with Special Needs, O.T. groups, schools, team building seminars and much more. Aaron tutors regularly throughout the week at various venues for beginners and intermediate alike. 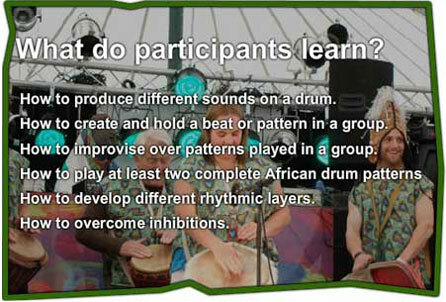 Aaron also tutors from home teaching drum kit and offers sound healing treatments. Aaron plays gongs and is a qualified sound healer, trained by Simon Heather at the college of sound Healing using his voice and other textural instruments to create a relaxing and healing environment for the client. Aaron has been CRB-checked, has public liability insurance and is a member of the musicians union. Aaron is an enthusiastic and reliable tutor, trained by Community Music Wales, Arthur Hulls Rhythm Playshop and has over a decade of experience in facilitating groups and connecting people through rhythm. Booking Slappingskins will ensure that your event goes off with a bang as Aaron is an enthusiastic and engaging drum facilitator who likes to get everyone involved in the rhythm. Bookings can be tailored to suit individual needs and group sizes. Links to some of Aaron's friends.